This picture is a dumb argument. It equates selective breeding with genetically modified organisms(GMO). While both involve deliberate manipulation of the genome, they are rather different. Selective breeding alters the frequency of alleles(gene variants) that are already present in a population. You aren’t likely to get hairy tomatos, because the genes necessary for that don’t exist in the tomato genome. 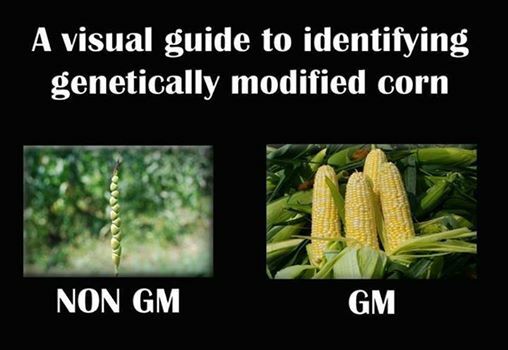 GMO, however, actually adds genes and alleles that were not present in any frequency. This manipulates the organisms genome on a much more fundamental level. It’s the difference between swapping to high performance tires on your car and adding a machine gun to your car. The implications are much more complicated- genes can interact with each other in unexpected ways. Now, I’m not saying GMO should be banned- if nothing else, without GMO we’ll eventually have the choice between culling and allowing people to starve to death. It is an absolutely crucial technology for the future of humanity. But using selective breeding to argue in favor of it is pretty much irrelevant.